There are lots of things that don’t happen every day. Last weekend the thing that didn’t happen was our trip to Gainesville. The plan started last Monday when I realized that Julie would be out of school, that I would probably have the weekend off, that Dennis had no plans, and that I had no committments to sing in church at that point. It was a good opportunity to go up and check on things at the little farm – we hadn’t been there for quite a while. On Friday Julie texted that we might not want to spend the gas money coming up since she was scheduled for her first externship at a town about 50 miles away. We would probably be able to get together during the week. And suddenly it seemed like a relief to have a reason not to go. Honestly I think that God planned a mini-vacation for me. I rested, did some very satisfying sorting/cleaning projects, and spent happy hours outside in the oneacrewoods with my plants and the sunshine and fresh air. I didn’t go anywhere the whole weekend, except to show the condo one more time. My house is such a beautiful place to be. I really should spend more time here. 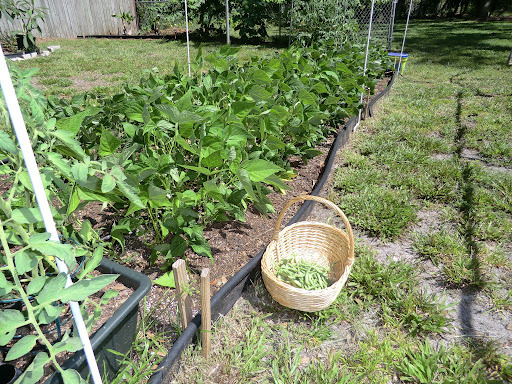 Hey, look at the beans first picking, and my pineapple farm…. 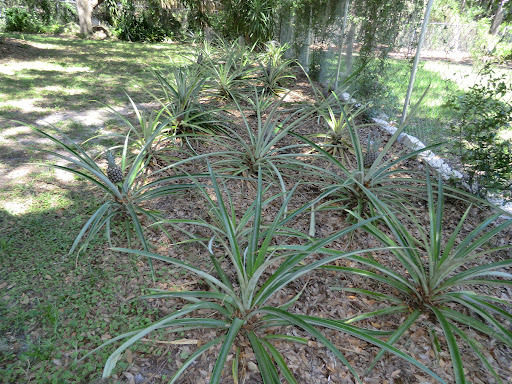 I have about a dozen pineapples this year to share with the fruit rats and raccoons. We have at least one raccoon that strolls past the patio doors in broad daylight, looking for something to eat no doubt since we have “raccoon feeders” in the neighborhood. We also have discovered an armadillo who comes under the fence from Jurasic Park and digs holes all over our yard. I’m trying to think of it as lawn aeration – they say you should do that periodically. Add in the possums and the squirrels and hawks – we really have a good bit of wildlife. No wonder the cats are hesitant to go out. So this pretty special weekend was sandwiched in between saying goodby to Irene and Bob on Friday (they are probably back in Kenosha now), and having dinner with Julie on Sunday night as she made her way over to Zolfo Springs. A strange good thing also happened this morning at work. As I was pushing Scottie up to the pool for her swim (we always push her backwards, facing us, so we don’t run her feet into a wall) she had her hand on my arm and patted it and said “Thank you, Shirley” which was really strange because I hadn’t done anything to require thanking. And when I laughed and said “what for?” she said “just for being here”. I’ll remember this for a long time I think. It was one of those moments.